In any home, the sink, whether in a bathroom or a kitchen, takes a beating from heavy use. When choosing a new sink, you want to make sure that it's not only functional, but beautiful as well. Apron sinks are just one of the many sink styles available on the market today. Take a look at some examples of this style of sink in this apron sink slideshow. Apron sinks are also referred to as farmhouse sinks because they are reminiscent of the style and design of old farmhouse kitchens. If you can't find an apron sink that matches your kitchen décor off the shelves, you can always choose to get it custom made, like the sink pictured here, to match your kitchen countertops. This classic single basin apron sink is paired with modern colors and designs. The soft, rounded curves of the sink go well with the clean lines of the countertops. If you love the look of an apron front sink, but don't have countertops, consider a stand alone apron front styled sink like the ones pictured here. Some homeowners don't like to break up the lines of their countertops. Here's an example of how you can still achieve the apron front style design, but keep continuous, unbroken design lines of stainless steel counters. Here's a good example of a large double basin apron sink. 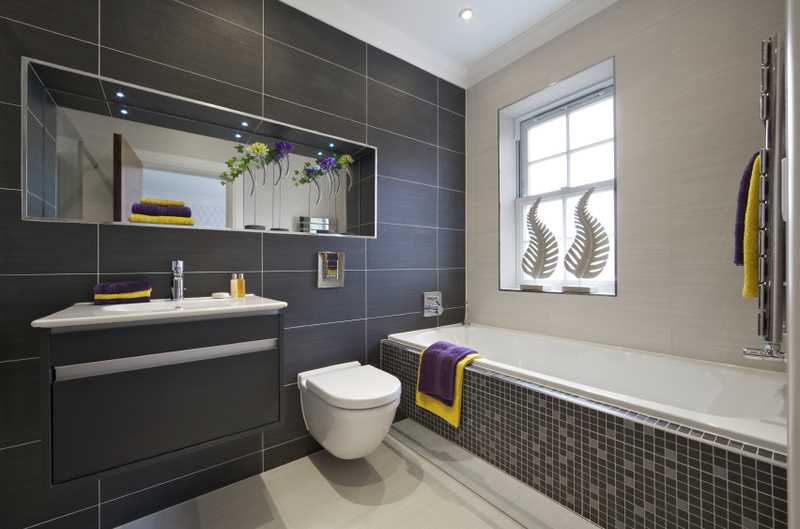 Even though the apron sink design is classic, it looks very modern in this bathroom design.